My Pugsley had been in pieces since I returned from touring South America over a year ago. I left most of the drivetrain, the threadbare tires, and anything else that had reached its end behind in Argentina. 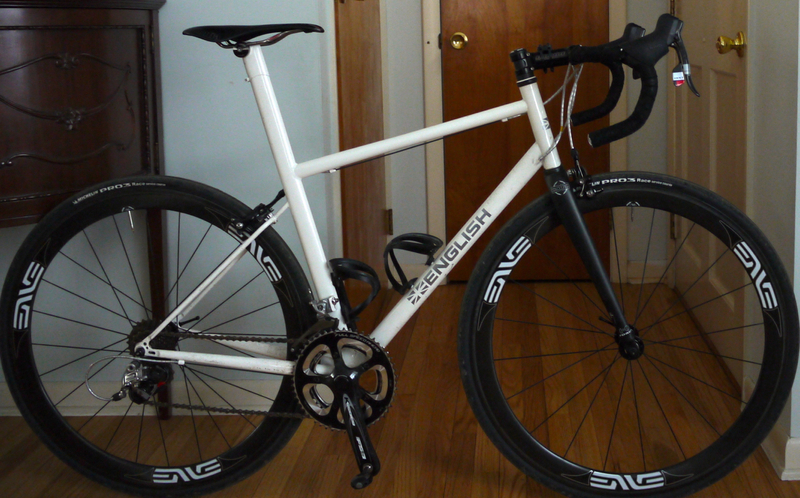 Last Spring, I sent out the frame for a repaint and some mods. That work was done quickly, but I hadn’t bothered collecting replacement parts until recently. 2010 Surly Pugsley frame with original offset fork drilled for a bottle cage and an Anything Cage on each leg, bottle mounts at rear dropouts (instead of hose clamps and yielding capacity for six bottles: two rear and four on the fork), downtube triple mount for Anything Cage. Canti posts removed. Matte black powdercoat. Shimano SLX trigger shifters, SLX rear derailleur/ceramic bearing pulleys, 12-36 Shimano HG61 cassette, XT front derailleur, Mr Whirly triple ring crankset, Race Face bottom bracket, KMC X9 chain, original Large Marge wheelset (XT rear hub, Surly front), Larry tires/downhill tubes, Avid BB7 brakes, Thompson post and stem, Easton Monkeylite bars, Ergon GS1 grips, FSA headset, Selle Italia SLR XP saddle, MKS Gripking pedals, King steel bottle cages. This is right now my go-to expedition cycling wheel. I really like the matte black powder coat.. Looks sweet! Pugsley’s get me hot in a bike-lust kinda’ way. 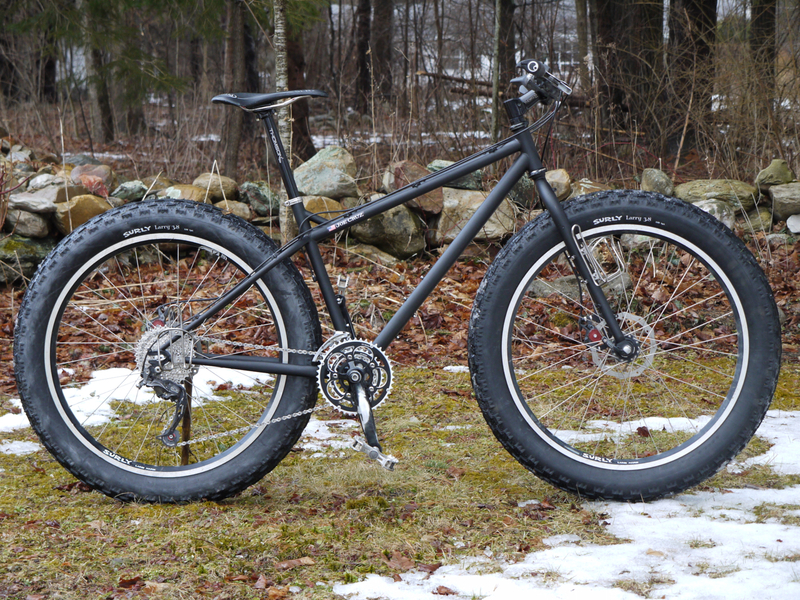 The next bike, FOR SURE, will be a fat bike. I’ve demo’d a Pugs several times this winter and all I have to say is wow… Why didn’t I throw a leg over one sooner??? Snow, ice, mud, dead critters, skis, broken snow machine parts; nothing, short of powder stops it. They are the tanks of the bike world. I agree.. love the black matte. That’s partly how I had my new Retrotec done too. It’s just personal opinion but since the original Snot Green, I really haven’t liked most of Surlys paint choices anyway. The mods you had done make a lot of sense. Sometimes, I really think that Surly tries to make their bikes too universally utilitarian. Maybe that’s why Salsa still exists. Just curious but why all the mid-level Shimano stuff? Is it because you can more easily find replacement parts in the middle of nowhere? A lot of it seems really heavy. Thanks, wunnspeed. I agree about Surly color choices, though I do have a fondness for those venerable Purples. Looks great, Joe. Hey, I got a pair of Anything type cages from Ron w/King Cage at NAHBS. No more broken cages! They’re only available in Ti, not stainless. They’re shaped differently than a AC- no wings and 3 type straps to hold the bag. I could send a photo if you’d like. Oops… 3 toe straps. Duh! Absolutely want a photo, Gary! Hey DD! Great to see a post from you, you’ve been missed. I hope that you’ve been doing some terrific riding and that you’re thriving. Nice to see this bike back together. I tensioned and trued your new front wheel yesterday after finally receiving the Surly hub I had been waiting for. A 36 hole hub accidentally arrived the first time around. The rear wheel has been done for a few weeks. Check your doorstep in the next week. I’m anxious to hear how the Pugsley, as a 29er, compares to the English. Joe I like your arrangement of water bottle towards the front and Anything Cage behind on the fork. Andy’s making me a fork that will be set up the same way. First Post here. Joe, thanks for the great reading and pictures documentation. A search on “Pugsley bike bag” brought me here. Question: Are the rear seat/chain stay cages attached via the single bolt to rack mount? Or, is your frame drilled for the bottom bolt to attach as well? Thanks and I’m sure I’ll be back frequently. Are you doing a bit of bikepacking on a Pugs? Very capable bike, that. Ahhhh…. I missed those detailed entries and photos of yours. Very creative and helpful for me! As far as bikepacking with my Pugs, that is my long term goal as I slowly add on to my Necro Pugs. I have done several trips with a less capable set-up so I’m looking to do longer and longer outtings locally this Summer. I’ll be purloining your fork idea for Peru Round 2. A couple of questions – how did you find the Anything Cages stand up to rough roads when mounted on the forks? I find that any cage I mount on the forks generally lasts less than a month before it breaks from vibration and so I’m reluctant to shell out big $ for them but I would love the capacity of the Anything Cage. And the Grip King pedals – I have them and love them, but do you find they need repacking with grease/replacing bearings quite often? I got a new pair when I was in Panama because and by the time I was in Colombia they had a lot of play and I’d already managed to get dings in the bearing race… I regreased and adjusted them yesterday and they are pretty good now but I just wondered what your experience with them has been. Terrific to hear from you, and I hope that you are doing exceedingly well. Eager for news from your travels. One of these days we will cross paths! Let’s see, regarding Anything Cages: I never had any trouble with them from rough conditions, but their fragility is, I think, a real issue from laying the bike down. Just about everyone I’ve talked to has noted that cracks develop near the mounting bolts. Evidently Salsa is doing a redesign. I can’t in good faith recommend this version, though, yes, the capacity is very compelling. I haven’t put them to a test yet but the workmanship is top notch and they look like they will do the trick. And as far as the Grip Kings, my experience is precisely the same as yours. They started out with that a smooth by dry feeling, and that came back pretty quickly after a regrease. At first I used to worry, but they’ve been spinning along for so long, I don’t much think about it. At any rate, I don’t think that your pair of them is atypical. Happy pedaling right back to you. Don’t hesitate to let me know if you need me to post anything to you. Hi Joe, I just got back here after ages! Thanks for your detailed reply and your offer to post things if I need them. That’s very kind. Any chance on a brief summary of your experiences with different tires? 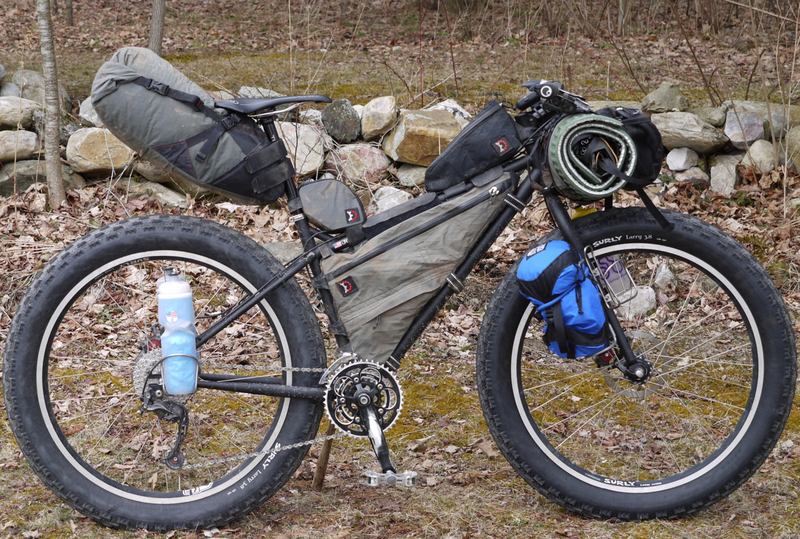 I wish I could be of more help on the fat bike tire front. But, really, I’ve been perfectly happy with the Larrys, which I rode in South America and that I replaced with a new set. (For what it’s worth, they are great: predictable, decent durability, and versatile.) Before them, I rode the only tires available, the Endomorphs. I’m certainly keen to give a try to the new generation of treads, but haven’t yet. In case you’d like to know: Found some On-One Floaters for even cheaper then they are. Tread looks pretty much like what I’m looking for, I think. Let’s see.